Are Weller and Jane still on the right in the third season of the Blindspot TV show on NBC? As we all know, the Nielsen ratings typically play a big role in determining whether a TV show like Blindspot is cancelled or renewed for season four. Unfortunately, most of us do not live in Nielsen households. Because many viewers feel frustration when their viewing habits and opinions aren’t considered, we’d like to offer you the chance to rate all the Blindspot season three episodes here. 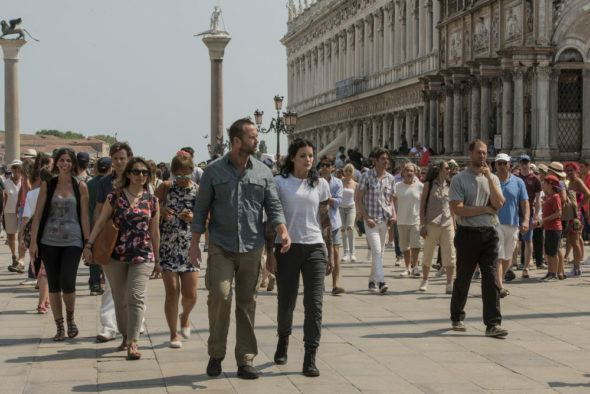 An NBC action thriller, Blindspot stars Sullivan Stapleton, Jaimie Alexander, Rob Brown, Audrey Esparza, Ashley Johnson, and Luke Mitchell. After amnesiac “Jane Doe” (Alexander) is found in Times Square, FBI Agent Kurt Weller (Stapleton) and his team work to decipher her intricate tattoos. Despite a web of conspiracy and corruption, they begin to uncover the clues therein, as well as Jane’s identity. The third season kicks off 18 months after the events of the season two finale. Although they parted ways thanks to a series of mysterious circumstances, the team must reunite to handle a new crisis. What do you think? Which season three episodes of the Blindspot TV series do you rate as wonderful, terrible, or somewhere between? Should NBC cancel or renew Blindspot for a fourth season? Don’t forget to vote, and share your thoughts, below. 5/10/18 update: NBC has renewed Blindspot TV show for a fourth season. Details here. I have been a fan of this show since it’s inception.It has a unique story line and interesting plots. I enjoy the diversity of the characters and how they interact. The cast is excellent and does a great job with the characters. Please keep this show alive. LOVE Blindspot!!! Please don’t cancel it. The best TV show at the moment, by far! t.v. listings. One week it’s on and then it’s not. This is very frustrating. I have been a big fan of this show from the beginning, plus I am a friend os Ashley Johnson. I think this show is great, and always has exciting stories! Please Please Please save this show! There are enough storylines out there to keep this show on the air for a long time. Jane and Weller are such a great team, plus all the actors on this show. NBC needs to put this show in a great timeslot. I beg of you, please do not cancel this show. I look forward to it every week. This is one of my favorite shows. I look forward to seeing this weekly! Do not cancel this show. I think its a great show! Do not cancel this show!! Great show please don’t cancel it. It is one of the two shows that brought me back to NBC. Love the show, however the music, sometimes annoying, drowns out a good deal of the important conversation which makes it hard to watch. Often like nails on a chalkboard to us. I really enjoy watching this show. It is different. It would be fun to have more focus on solving the tattoos but I love it regardless. I do need to say I absolutely love the actress who plays Jane Doe, Ashley Johnson and the actor who plays Roman, but the others could be replaced and I wouldn’t miss them. Overall one of my faves..
Love this show please don’t cancel it! This show is so cool. It’s fascinating with all its twist and turns. We love watching it. It is one of our top 5 shows to watch, out of all the shows offered by all the networks. We hope they give Blindspot several more seasons.